From artist Aled Lewis to be shown at an art show called Crazy 4 Cult in NYC, starting Thursday. For those interested, it’s on 64 Gansevoort St down in Meatpacking. Maybe a reason to go down there for the first time in years? Ever since the Village Idiot closed, it’s not been the same. That would probably be the coolest, bloodiest and funniest game ever!! I’ve all of a sudden got a craving for a strwberry cornnetto?! Ha! Or at least some pig snacks. 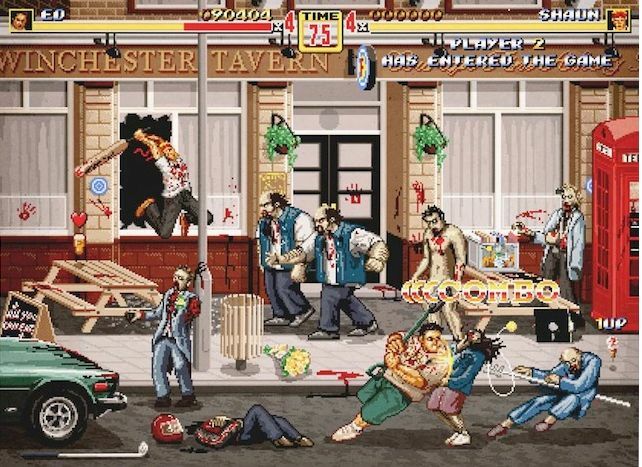 Seriously, Scott Pilgrim as a re-skinned River City Ransom totally worked, I don’t see how a SotD re-skinned Capcom beat-’em-up wouldn’t be equally as rad. Was just talking about this movie today!